Although economic growth has disappointed, the new Federal Reserve chairwoman has successfully persuaded markets that official rates will remain “low for longer”. Unsurprisingly, the dollar has weakened over the past year. Her munificence is not totally appreciated across the Atlantic. What is seen in the US as a proactive attempt to stimulate a still-weak economy is an additional complication at the European Central Bank. The result could be a damaging competition between the advanced world’s central banks to weaken currencies and stimulate economies. Obviously I don’t think this sort of competition would be damaging. But the title of this post is sincere, not sarcastic. I honestly don’t know what sort of damage the FT has in mind. I wish they had told us. PS. The article also suggests that some believe Yellen’s policies are hurting Europe. That claim does make me want to be sarcastic. I guess they didn’t notice how European stocks react to American monetary stimulus. How do marriage and education relate to successful societies? Recently I’ve been toying with some ideas that seem contrarian, but perhaps that merely reflects my ignorance of the literature. Marriage and education are highly correlated with positive life outcomes, in many dimensions. Many people believe the causation runs from marriage and education to better life outcomes. Some believe that policies that improve education and encourage higher marriage rates will lead to better societies. This is where I become a bit skeptical. Steve Waldman has a post that does an excellent job of explaining why encouraging more people to marry is a bad idea, especially where their marriage options are far from optimal. Perhaps economic success causes higher marriage rates. Ross Douthat has a long commentary on the Waldman piece, which is equally brilliant. When I read those two I’m sort of like the pillow that has the impression left by the last person who sat on it. Here I’d like to make a Waldman-type argument for education. I’m not wedded to this hypothesis (and I also have an open mind on the utility of marriage) but I think it’s at least worth considering. The argument I’d like to make is that good educational systems don’t cause good societies; rather good societies cause good educational systems. I’m going to cheat a bit in my definition of “good societies,” both by leaving it vague and allowing that it might to some extent apply to a poor place like South Korea circa 1970. In other words societal quality is related to many variables beyond income, including social cohesion, low levels of violence, lack of tribalism, liberal attitudes in the broadest sense of the word (such as empowering women and allowing dissent), etc. Why are so many intellectuals attracted to the idea that better education can help solve society’s problems? Partly because they are intellectuals. Partly because at the individual level better educated people do better on average, in many respects. Partly because the idea appeals to both liberals and conservatives. They might disagree about precisely how the educational system should be improved, but can at least agree that an improvement would significantly improve society. 1. I’ve never met anyone who’s life outcome seemed strongly linked to the quality of their schooling, particularly the parts of education that get all the attention (quality of structures, teachers, curriculum, etc.) I’ve known people who dropped out of high school, or chose not to go to college when they could have, but in no case was their decision in any way related to a dysfunctional school system. Nor have I ever participated in a discussion of another person not present (i.e. gossip) that attributed that person’s failings to the schools they went to. It’s always personal qualities, or a tough home environment. I can imagine that there might be cases where education was to blame, but typically those cases are associated with attending schools with a climate of fear, a lack of respect for learning, and a non-supportive home environment. I.e., things that are not easily reformed through public policy. FWIW, one reason I support vouchers is that I believe that private schools would be less likely to be dominated by a climate of fear. So I’m not saying policy has no effect. 2. Bryan Caplan recently discussed some studies that show how efforts to improve education in poor countries often produce disappointing results. Students often attend schools for many years, and still have weak academic skills. This obviously fits in with my hypothesis. In my view the educational failures of countries like Afghanistan and Haiti are more likely to reflect the dysfunction of society than a lack of spending on schooling. Is there any evidence in favor of my hypothesis? You would want to find some places with “good institutions” in general, but which for some quirky historical reason abandoned good schools and marriage. If I’m right, those places should still be highly successful. After all, I’m claiming that success leads to good schools and successful families, not vice versa. An implication is that if some quirky historical factor blocks the normal “success –> marriage/education” outcome, then the success will still be there. So where is this contrarian utopia? Utopia means nowhere, but it seems to me that Sweden comes close. I’m told that the “hippie generation” ruined Sweden’s school system with very lax policies. I’m not sure if that’s true, but they do score relatively low on international rankings, far below neighboring Finland. Yet Sweden is one of the richest countries in Europe, indeed richer than Finland. Sweden also has fairly low marriage rates. The counterargument is that many Swedes have stable partnerships without being married. But I see that as supporting my point. In a successful society you can remove an institution that Douthat believes is essential, and still achieve success. To be sure, Sweden’s schools are still light years ahead of those in Afghanistan and Haiti, and you do need a certain amount of education to have a successful society. But as I observe my daughter go through the 9th grade in a highly rated public high school, I am struck by how much of what she learns will have no useful role to play in her future career. Some of the math homework is geometric problems that even engineers would rarely see, or endlessly solving various arcane algebraic relationships. A skill that would never even be used in most technical fields, but will help on SATs. There is lots of stuff on things like agricultural techniques in the Middle Ages. I’m not trying to be critical, it’s great that they are already studying concepts like Acemoglu’s extractive/inclusive distinction in the 9th grade. I’m an intellectual too. My only point is that a society can be full of reasonably happy productive people even if they only learn 1/2 of what my daughter learns (please no one tell her.) Sweden has happy productive people with a school system far inferior to that of Finland. It seems to me that a mediocre school might make it harder to become a doctor or lawyer. But are there actually people who didn’t learn enough to find middle income jobs like electrician, nurse, cop, plumber, etc., simply because the schools weren’t good enough? Or was the actual problem that they didn’t study hard enough? (Perhaps due to a nightmarish home/neighborhood environment””I’m not interested in blaming the victim here.) If I’m right, how will fixing our schools solve poverty? Are there arguments in the other direction? I recall there is a Heckman study showing that having good teachers when young can produce lifelong benefits. I’d be interested in hearing other views. I’m not wedded to my skeptical views of marriage and education. I’ve been married for 20 years and am a teacher. PS. Being a contrarian I was attracted to the idea of doing this post partly because the marriage skepticism puts me on the liberal side, whereas my views on education seem slightly at odds with a popular liberal solution to society’s problems. PPS. I also wonder if China is an example of my hypothesis. At least until recently, they spent relatively little on education. It seems to me that China’s economic growth is causing education to improve, more than the reverse. PPPS. One problem with the otherwise excellent Waldman post is that he describes an America split between the rich and poor. I doubt this is true; the vast majority of Americans are probably in the middle. At least if you accept the assumption that income is the right way to measure inequality. I don’t, so I’m still willing to consider the two societies hypothesis. But where is the evidence? The mood of Kamalpur’s residents is revealing. As they are mostly Muslims, Congress hopes for their votes. Yet the party’s main message interests nobody. No one speaks in favour of public welfare, subsidised rice and wheat or efforts to provide make-work jobs, policies supposed to give Congress the support of the rural poor. “A programme is good if it reaches here, but it doesn’t come,” says one man, sparking a lively chat about crooked politicians. A good road to the city helps more. These voters back the BJP and predict rapid economic gains after the election. They are impatient for a better life, having tasted the optimism that faster expansion brought in the 2000s. Frustrated since then by slower growth (stuck at 5%) and high prices, they want Congress crushed. This election is likely to be seminal. A campaign strategist for a big party talks of “citizen consumers” who are intolerant of substandard politicians and readier than ever to dump them. These more demanding voters are emerging thanks to three intertwined trends: a youth bulge, urbanisation and rising incomes. In time, they should help to improve the political system. The rise of the young is dramatic. Around half of India’s 1.2 billion people are under 26, with no memories from before the first liberalising reforms of 1991 but aware that development still lags. These “born frees” are the vanguard of a huge number who will come of age in the next two decades. I’m more interested in the mood of the voters. India has more people that the US, Canada, Japan, Australia and Europe combined. Poverty is the big problem. And if we can believe The Economist, they just voted for growth over redistribution. That fact (not the election of BJP) makes me more optimistic. “Dear Leader”, which includes three personal poems, is a testament to Mr Jang’s literary flair. He chooses poetry to express painful episodes, whether the hunger of a young girl or the public execution of a farmer in his home town. He paints a bleak portrait of his village, to which he briefly returns to discover a swarm of wasted bodies “waiting for death”, a childhood friend eating rice by the grain and tap water for sale. Desolation creeps even into better-off Pyongyang: a mother, close to death, and her daughter stand in a marketplace; a sign hangs from the girl’s neck: “I sell my daughter for 100 won ($0.11)”. I’ve been reading the Economist for 40 years, and it’s greatly influenced my worldview. It’s made me see the entire world as “us.” It’s convinced me that progress is 90% growth and 10% redistribution. Of course 10% is still quite important in absolute terms. But even that issue is quite complex. Suppose Bill Gates’ entire fortune was transferred to the US Treasury. How would that impact US equality? How about global equality? Those two questions might have very different answers. Again, focus on consumption, not wealth. During her previous grand coalition Mrs Merkel made one big domestic reform. In Europe’s fastest-ageing country, she raised the retirement age from 65 to 67. Sadly, there is less method in the seeming madness of the present coalition’s opening salvo of policies””what Germans are calling RefÃ¶rmchen, or “reformlets”. One of these again affects pensions, but in the opposite direction, lowering the retirement age for certain workers to 63, and perhaps even to 61 if years in unemployment are counted. Economists and employers are screaming foul. So are 50 of the 311 parliamentarians from Mrs Merkel’s own centre-right camp, who fear the economy will suffer. Another RefÃ¶rmchen is to introduce a national minimum wage for the first time, of â‚¬8.50 ($11.72). This will affect about 14% of workers nationwide and 20% in the less productive former East Germany, according to a study by three economists at universities in Magdeburg, Berlin and Dresden. When Britain introduced a minimum wage in 1999, it affected only 5% of workers. Germany’s wage floor would barely increase incomes of poor workers, because they would lose welfare top-ups, the study says. But it could mean that as many as 900,000 lose their jobs. And it could stop young people (over 18 but under 21) getting good training and permanent jobs at all. The government has also intervened messily in the property market, where rents are rising fast in some cities. It will cap increases in rent when re-letting flats to at most 10% of the rental average in the relevant district. The rules are still vague. But that hasn’t stopped landlords from panicking and raising rents as high as they can in anticipation. Investors who were planning to build new housing are thinking again. That’s what happens when you give the conservative party a big victory. And it reminds us not to expect too much from Mr. Modi. EVER since Lehman Brothers went bankrupt in 2008 a common assumption has been that the crisis happened because the state surrendered control of finance to the market. The answer, it follows, must be more rules. The latest target is American housing, the source of the dodgy loans that brought down Lehman. Plans are afoot to set up a permanent public backstop to mortgage markets (see article), with the government insuring 90% of losses in a crisis. Which might be comforting, except for two things. First, it is hard to see how entrenching state support will prevent excessive risk-taking. And, second, whatever was wrong with the American housing market, it was not lack of government: far from a free market, it was one of the most regulated industries in the world, funded by taxpayer subsidies and with lending decisions taken by the state. The numbers would amaze Bagehot. In America a citizen can now deposit up to $250,000 in any bank blindly, because that sum is insured by a government scheme: what incentive is there to check that the bank is any good? Most countries still encourage firms and individuals to borrow by allowing them to deduct interest payments against tax. The mortgage-interest subsidy in America is worth over $100 billion. Even Bagehot’s own financial long-stop has been perverted into a subsidy. Since investors know governments will usually bail out big financial firms, they let them borrow at lower rates than other businesses. America’s mortgage giants, Fannie Mae and Freddie Mac, used a $120 billion funding subsidy to line shareholders’ pockets for decades. The overall subsidy for banks is worth up to $110 billion in Britain and Japan, and $300 billion in the euro area, according to the IMF. At a total of $630 billion in the rich world, the distortion is bigger than Sweden’s GDP””and more than the net profits of the 1,000 biggest banks. How can the zombie-like shuffle of the state into finance be stopped? Deposit insurance should be gradually trimmed until it protects no more than a year’s pay, around $50,000 in America. That is plenty to keep the payments system intact. Bank bosses might start advertising their capital ratios, as happened before deposit insurance was introduced. Giving firms tax relief on financing costs is sensible, but loading it all onto debt rather than equity is not. And still more can be done to punish investors, not taxpayers, for failure. As well as being global, the crash of 1857 marked another first: the recognition that financial safety nets can create excessive risk-taking. The discount houses had acted in a risky way, holding few liquid assets and small capital buffers in part because they knew they could always borrow from the Bank of England. Unhappy with this, the Bank changed its policies in 1858. Discount houses could no longer borrow on a whim. They would have to self-insure, keeping their own cash reserves, rather than relying on the central bank as a backstop. That step made the 1857 crisis an all-too-rare example of the state attempting to dial back its support. It also shows how unpopular cutting subsidies can be. The Bank of England was seen to be “obsessed” by the way discount houses relied on it, and to have rushed into its reforms. The Economist thought its tougher lending policy unprincipled: we argued that decisions should be made on a case-by-case basis, rather than applying blanket bans. Others thought the central bank lacked credibility, as it would never allow a big discount house to fail. They were wrong. In 1866 Overend & Gurney, by then a huge lender, needed emergency cash. The Bank of England refused to rescue it, wiping out its shareholders. Britain then enjoyed 50 years of financial calm, a fact that some historians reckon was due to the prudence of a banking sector stripped of moral hazard. Argentines themselves must also change. The Kirchners’ redistributive policies have helped the poor, but goodies such as energy subsidies have been doled out to people who do not really need them. Persuading the population to embrace the concept of necessary pain will be difficult. That is partly because the experience of the 1990s discredited liberal reforms in the eyes of many Argentines. But it is also because reform requires them to confront their own unprecedented decline. No other country came so close to joining the rich world, only to slip back. Understanding why is the first step to a better future. The neoliberal reforms worked fine until 1998, when monetary policy became much tighter. No wonder it’s so hard for Argentine voters to develop an “understanding” of what went wrong. The group that delivered the free market reforms is the same group that delivered the hard money policies that drove Argentina into deflation and depression. The entire article on Argentina’s long, sad decline is worth reading. The accompanying photo reminded me of The Purple Land, a novel you don’t hear much about anymore. Is economics getting more liberal? As an econ blogger, I get the sense that this is exactly how many Americans still think of economists””as self-appointed defenders of the free market, spinning theories to show that greed is good. Watching those old Milton Friedman videos, I wonder if that picture might have been accurate in the 1960s and 1970s. But some big things have changed in the field of economics, and America should know about them. Three big changes stand out in particular: Econ today is more data-driven, far less politically conservative, and in general much more like engineering than it used to be. I think it’s much more complicated. Economics was very liberal in the 1960s and 1970s. When I studied at Wisconsin (1973-77), Milton Friedman was viewed as a crackpot. So Smith is actually 180 degrees off in terms of the 1960s and 1970s. Then after the mid-1970s the profession started moving to the right, becoming much more conservative in the 1990s. Policy also moved in that direction. Since 2007 economics has moved sharply to the left, and indeed was already moving a bit in that direction before 2007. I don’t see much evidence that economics is more data-driven. Then and now you have policy pundits (Friedman, Krugman, etc) and lots of ordinary economists doing empirical and theoretical studies. Here’s one example of my skepticism. If we really were becoming more like engineering, why is it that in 2008 lots of top macroeconomists didn’t seem to be able to offer any useful policy advice. Their models seemed unable to handle the biggest fall in nominal spending since the 1930s. And let’s say I’m wrong about Paul Krugman, and that Krugman actually had good advice on fiscal stimulus. As far as I can tell Krugman was relying on 1960s IS-LM models, not modern “engineering-type” DSGE academic studies. Is that wrong? PS. After I wrote this I saw a similar post by David Henderson. I almost refrained from piling on, but then I realized that it was Noah Smith. PPS. I see the Swiss voted 3 to 1 against instituting a minimum wage law. I guess we can anticipate huge shantytowns on the outskirts of Zurich and Geneva, as the low paid Swiss workers struggle to survive in their squalid slums. The voters also rejected the military’s request for more jet fighters. Two good decisions. I wish Americans could vote on projects that even the military says are not necessary, but are funded because a few Congressmen need jobs in their districts. This caught my eye because the charts, which come by way of Credit Suisse, fail to take into account the idiosyncrasies of the System of National Accounts (SNA), which both Japan and the Euro Area use. Under SNA, investment spending includes both private and government investment spending. The item labeled “government expenditures” in the graphs is actually just government consumption spending, and doesn’t include government investment spending. Why does this matter? Because in the 1990s the Japanese government engaged in a massive old school Keynesian fiscal stimulus, heavily tilted towards government investment spending (i.e. “infrastructure”). The Credit Suisse graphs totally miss that, and imply that the decline in Japanese private investment spending was much smaller than it actually was. Japanese real government investment spending increased by over 50% in between 1992Q1 (the peak in RGDP before the recession) and 1996Q2. 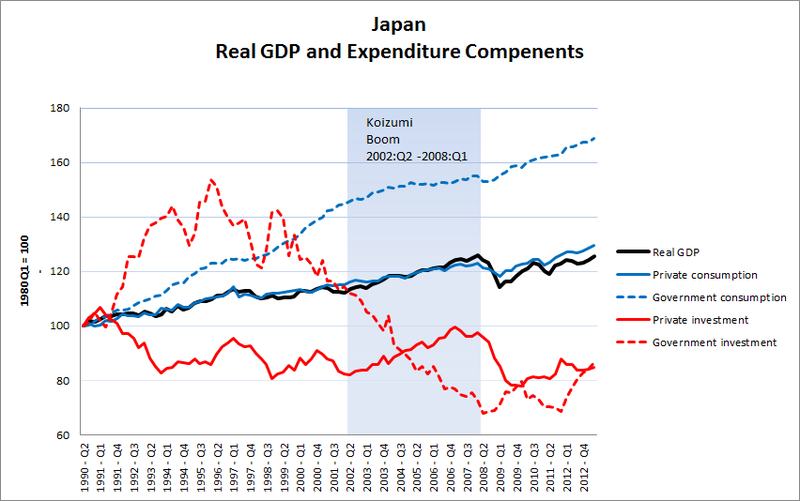 This was not a trivial amount because unlike in the US and the Euro Area, where government investment spending is only 3.4% and 2.1% of GDP respectively, Japanese government investment spending reached a staggering 9.9% of GDP in 1996Q2. Now, one can argue that things would have been much worse in the absence of this massive infrastructural spending, but as Kaminska goes on to note, Japan didn’t lose monetary policy traction until much later. In fact the BOJ’s call rate didn’t really hit the zero lower bound until March 1999. One other thing that I think is worth calling attention to is the fact that the failure to disaggregate Japanese investment spending leads to the failure to notice that private investment spending soared during the Koizumi Boom in the 2002-2008. This is because while private investment spending increased, public investment spending decreased, obscuring a boom in private investment within the aggregate investment statistic. Thus I encourage people to compare the Credit Suisse graph with David Andolfatto’s. And of course we all remember when Japan did its first ryÅteki kin’yÅ« kanwa (QE). That was from March 2001 through March 2006. Coincidence? Incidentally, in the case of the Euro Area, government consumption and investment spending is the only major component of GDP that is higher in real terms than it was in 2008Q1 (the peak in RGDP before the recession), over six years ago. In contrast, in the case of the US, the only major component of GDP that is lower than it was in in real terms in 2007Q4 (the peak in RGDP before the recession) is government consumption and investment spending. The difference is obviously attributable to the fact that the US has done QE, and that the Euro Area is only now considering its possibility. BTW, Izabella Kaminska ends her post by arguing that Mr. Draghi needs to step up to the plate if the eurozone is to avoid Japanese-style stagnation. I completely agree. PS. My only quibble with Mark’s comment is his characterization of Kaminska’s view on the monetary transmission mechanism. She doesn’t really say when it broke down, only that it was clearly operative at least until the mid-1990s.